The false report claimed that the news of Millan's death was shared to the media by his wife Jahira Dar. A report claiming that popular 'dog whisperer' Cesar Millan had died of heart attack on Tuesday morning is nothing but a lie. The death hoax report was published by a website that claimed to be the popular Spanish news agency - ProcesoMX. The report on the fake website was soon picked by many on social media as thousands of his fans shared it on Facebook and Twitter. The Cesar Millan death hoax now has gone viral. The 45 year old Mexican/American, born in De la Cruz, Sinaloa, who made a name for himself with his incredible rehabilitation and training technics wit dogs, duty in which he professionally wrote three books on the topic "Cesar's way" "Be the pack leader" and "Member of the family", he reach worldwide popularity with his TV series "The dog Whisperer", this name would be the new way people knew him, he died this morning in Santa Clarita hospital in California. Millan was hospitalize yesterday afternoon, the medical reports indicate that he suffered a fulminate heart attack, which paralyze his heart unavailable for the blood to reach his brain, and other vital organs, situation witch cause the death of this humanitarian man, who years before open his foundation "Cesar Millan Foundation", where Jada Pinkett Smith, wife of Will Smith, is Vice-president. "the sad news of Millan's death was given by his wife Jahira Dar in a news conference, a couple of hours ago, where she said to the media, 'I hope you can understand my loss, and I would appreciate if you can give us our space for our mourning.'" The report, however, was soon rubbished by many. A Mexican news source, Monitor National, stated that the "misinformation caused great impact and controversy in social networks" as thousands of his fans started grieving for their favourite dog trainer. The worried admirers of Cesar Millan can now rest assured that the 'dog whisperer' is safe as he has been seen active, both on his Facebook and Twitter accounts. A self-taught dog trainer, the Mexican American TV show host, is widely known for his television series, Dog Whisperer with Cesar Millan, which is televised in more than 80 countries worldwide from 2004 to 2012. An admirer, Susanne Nilsson, commenting on a recent post by Cesar Millan, said:" I hope u safe and well Cesar. 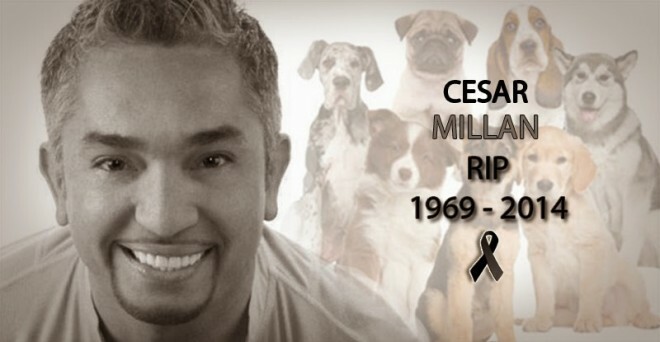 Please comfirm that this News are fake..I only have one idol and thats you..Big hugs from Sweden"
Meanwhile, Invisible Man ‏@CHADinAMSTERDAM posted: "RIP to Cesar Millan. Dude always came across as good folks." Kerem Soyyilmaz ‏@keremsoyyilmaz said: "Rest in peace beautiful man, this is sooo early. With love, your dog friend @cesarmillan "
Another fan, Aimee ‏@AmyL618, said: It's a hoax right? Someone please tell me @cesarmillan is okay and not dead. I love him and he changed my life. I need the truth.